I started craving fall desserts. I started with pumpkin naturally. Although I was probably influenced by picture after picture of pumpkin desserts on Facebook. I love pumpkin pie. I didn’t grow up liking it. Mainly because my parents didn’t like it so my siblings and I automatically never ate it and thought it was gross. My Grandma used to bring a pumpkin pie to every Thanksgiving dinner and I finally started eating it as a teenager. I’ve been hooked on pumpkin pie ever since. This pumpkin pie is crustless. I love that! I’m not really into adding tons of nuts to my diet through grain free crusts. If I can avoid adding a crust I usually do! As a single lady (automatically singing that Beyonce Single’s Lady song in my head) it’s easier for me and hopefully you to have desserts that are smaller in portions and don’t create leftovers for a week. 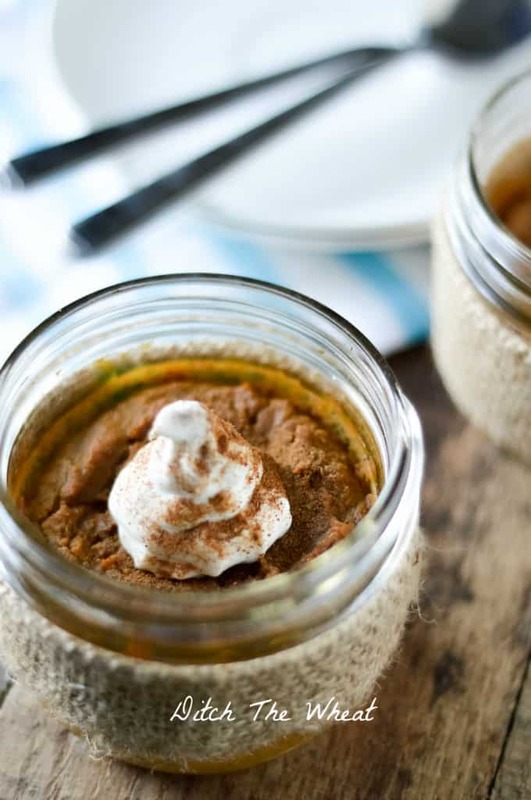 In a food processor or mixing machine mix all the pumpkin pie ingredients. Place the ingredients in a 2 large ramekin or 2 glass jars (as shown in the pictures). Place the jars in a larger baking dish and fill with a few inches of water (to create a water bath). Bake for 15 minutes and then reduce the oven temperature to 350 degrees F. for 35 minutes. The mini pumpkin pies are ready when the top begins to crack and the custard is set (doesn’t look raw). Allow the pies to cool. 1/4 cup coconut cream, the cream that rises to the top when you place a can ofcoconut milk in the fridge for a few hours. *Look for a brand that only contains full fat coconut milk and no other added ingredients. In a small bowl whisk together all the ingredients and either spoon onto the cooled mini pies or place in a pipping bag and decorate the top of the pies with the cream. 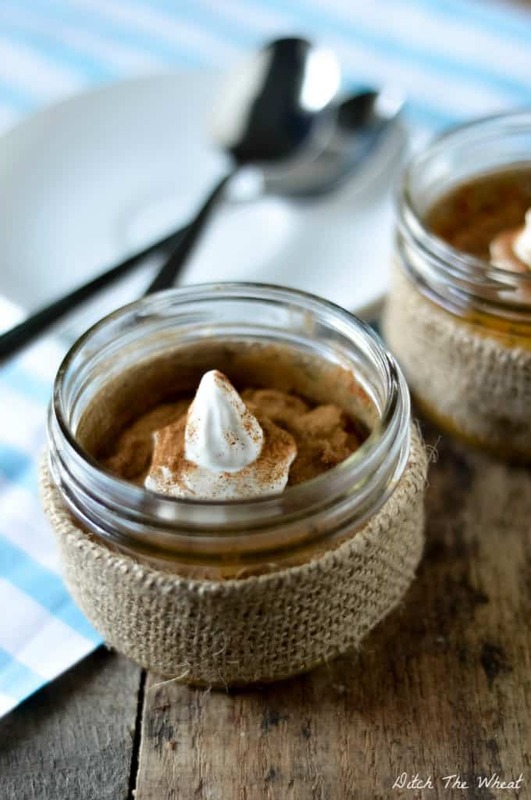 For a nice presentation, sprinkle a little cinnamon on top of the coconut cream.